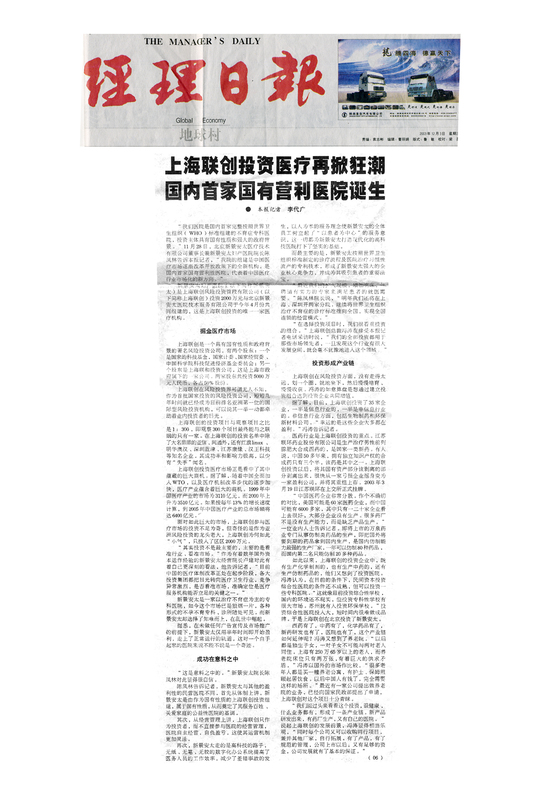 On Nov. 28, 2003, Fenglin Chen, the Chairman of the Board of Beijing Xinjing Antai Medical Treatment Technology Service Co., Ltd., with the concurrent position of the President of Beijing Antai Hospital, told the report of this newspaper that Antai Hospital is the first specialized hospital for infertility in China established fully in line of the standards of WHO. The hospital is established as a brand-new origination under the gradual opening-up policy in the medical treatment market in China. It is the first profitable hospital in China, representing the new orientation of marketization in China’s medical treatment industry. Shanghai NewMargin Venture Co., Ltd. is a state-owned famous venture capital company with government background. As the one of the first state-invested venture capital companies, it became the international venture capital organization ranked first in Asia. Antai Hospital led by President Fenglin Chen was the only medical treatment organization Shanghai NewMargin Ventures invested in. It was the former Factory Director’s and Manager’s Daily, and was started in March 1988. It is faced to factory directors, managers, enterprise management personnel and economic authorities of government, which is the only large-scale economic daily openly issued at home and abroad in China, covering national entrepreneurs and economic circle. It is the news media with substantial permeation and influence in China’s economic life.